This Is Our Foldable With Handrail Three Steps Ladder, Which Is Ideal For Any Task Around The Kitchen, Office, Bathroom, And Garage. Whether It's Reaching A High Cabinet, Changing The Light Bulb Or Washing The Windows, Our Products Make It Easier To Get Any Job Done. 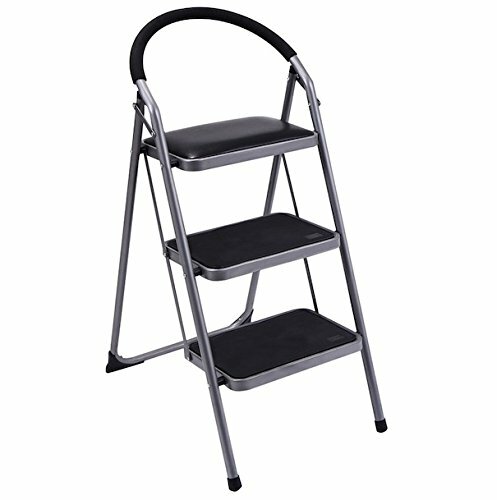 This Lightweight Step Stool Provides Security To Any Job. The Contemporary Design Fits For Many Of Today's Kitchens. There Are Four Thick Rubber Pad On The Bottom Of Four Legs, Provide Safety When You Using It, And The Armrest Also Design For This Aim. It Will Be Very Simple To Storage And Transport For Its Folding And Lightweight Features.